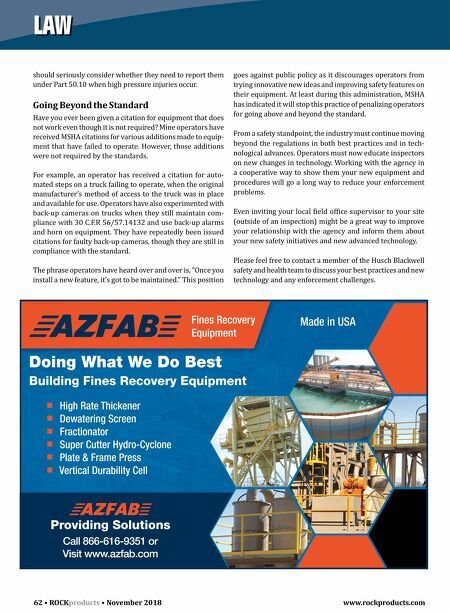 62 • ROCK products • November 2018 www.rockproducts.com LAW should seriously consider whether they need to report them under Part 50.10 when high pressure injuries occur. Going Beyond the Standard Have you ever been given a citation for equipment that does not work even though it is not required? Mine operators have received MSHA citations for various additions made to equip- ment that have failed to operate. However, those additions were not required by the standards. For example, an operator has received a citation for auto- mated steps on a truck failing to operate, when the original manufacturer's method of access to the truck was in place and available for use. Operators have also experimented with back-up cameras on trucks when they still maintain com- pliance with 30 C.F.R 56/57.14132 and use back-up alarms and horn on equipment. They have repeatedly been issued citations for faulty back-up cameras, though they are still in compliance with the standard. The phrase operators have heard over and over is, "Once you install a new feature, it's got to be maintained." This position goes against public policy as it discourages operators from trying innovative new ideas and improving safety features on their equipment. At least during this administration, MSHA has indicated it will stop this practice of penalizing operators for going above and beyond the standard. 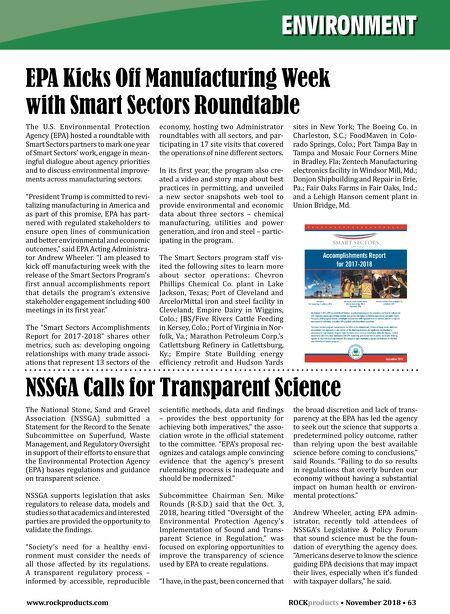 From a safety standpoint, the industry must continue moving beyond the regulations in both best practices and in tech- nological advances. Operators must now educate inspectors on new changes in technology. Working with the agency in a cooperative way to show them your new equipment and procedures will go a long way to reduce your enforcement problems. Even inviting your local field office supervisor to your site (outside of an inspection) might be a great way to improve your relationship with the agency and inform them about your new safety initiatives and new advanced technology. Please feel free to contact a member of the Husch Blackwell safety and health team to discuss your best practices and new technology and any enforcement challenges.